The moment I step into a church I sense the tranquillity of the place – especially when the church has emptied of its occupants and there are no longer voices echoing between the walls. 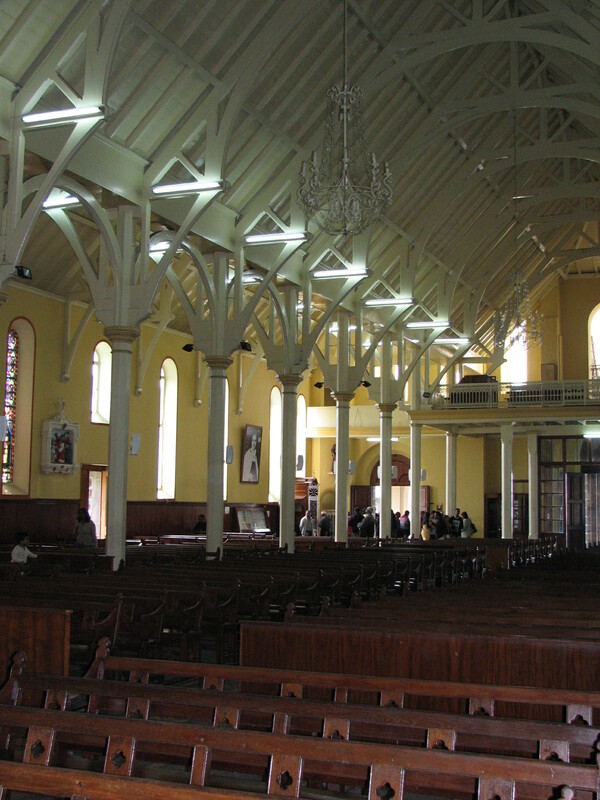 The rows of benches stretch over the interior of the quiet church give one the impression of infinite tranquillity. What do you sense when you step inside a church? I feel the same way. And I always feel that I want to sit down and think on God only for a while. Peace and a sense of being grounded once again. Entering a place of worship certainly helps to ground me as well. It is almost as if peace embraces me. I so agree; the infinite tranquility and peace in a church can be so amazing. Especially when everyone is so busy in their day to day lives. The church is quite an old one and was built when the island was a colony. I do too – and it is so interesting to see how different the people in these places have created their places of worship. The scents of the church seems to contribute to its tranquillity, does it not? The incense always reminds me of those special days in the church calendar and makes me think of the priest blessing the congregation. I don’t possess the eloquence to give it justice. I do like this post very much though. Thank you. I agree that it is sometimes hard to put into words your feelings – at times the words are not enough. I do too. I enjoy the variety of architecture – and the sense of peace I feel whenever I enter one. The architecture is not what you often find in modern buildings. I like that they have kept up this old building. The older ones in particular seem to have soaked up the atmosphere you refer to. Yet some, old and new, do seem to have uncomfortable vibrations. I have wondered why. Could it be that those have too much emphasis on hellfire and damnation, and not enough on peace and love? You may be right. I wonder, too, whether the vibrations from the builders would have had anything to do with it too. The builders of old built the churches with feelings of reverence and the belief that they were doing God’s work. Nowadays they build because it is a job. I like to think it has more to do with the vibrations soaked up over the years. Fanciful? Maybe. I’m thinking of Notre Dame in Paris, France. Simply awe-inspiring. Never empty, though. The empty ones make me feel peaceful and reflective. There are many beautiful ones in many countries, don’t you think? I love Notre Dame in Paris too. But, as you say, it is always filled with people – both worship peers and tourists. I enjoy visiting churches in different countries. They all seem to have something a little different in them that makes them unique to that country and culture. Beautiful shot, Colline. 🙂 I have mixed feelings about churches, but that’s a very long story. Very often I do find a sense of the sacred and of peace. It is this sense that I have often experienced in churches – no matter what religion they house. This church has some kind of similar architecture than we have in some churches in Finland. I love the photo. I am wondering whether they were built during the same period. It would be interesting to know.